By now I'm sure you've seen Pantene's thought-provoking #ShineStrong ads, like the one questioning the negative labels applied to assertive women in the workplace, or the one that cleverly pokes fun at the female tendency to apologize needlessly. As part of P&G's Beauty United blogger program, I was invited to share how I shine strong by answering a series of questions. (Think the Proust questionnaire, but with a Sheryl Sandberg Lean In bent.) Read my answers after the jump! Standing up for yourself, speaking your mind, and pursuing your dream. At the same time, I think the strongest people know when to approach things with a humble, questioning mind and maintain kindness, patience, and good humour in the face of obstacles. Pitch an article to then editor-in-chief of FLARE magazine, Lisa Tant. At the time I was incredibly grateful to even have the chance to do it; nothing ventured nothing gained, right? Luckily, she took a chance on this novice freelancer not once but twice and I was published in the June 2011 and 2012 issues. I'm actually an introvert by nature, so going out a lot can feel draining. A night at home with Netflix, a glass of wine, and a DIY mani—that's my idea of bliss. Otherwise I enjoy salsa dancing and am trying to work more exercise into my daily routines. What’s one thing you’ve always wanted to learn? I can't swim, drive, or ride a bike. Take your pick. How does your #bff #shinestrong? She's smart, she knows what she wants, and she goes after it! What natural talent would you want to be gifted with? I've always envied people who can be charming and talkative in any social situation. If I feel awkward or uncomfortable in a social setting, it really shows and I tend to shut down. When I was younger, I used to think it was achieving a certain level of financial success. Now what matters to me most is time. Having the time to spend on the things that truly matter in life and and with people I love is the ultimate luxury and happiness. To quote Tennyson's 'Ulysses': "Yet all experience is an arch wherethro'/ Gleams that untravell'd world whose margin fades/ For ever and forever when I move." I feel as though no matter how much I've done or seen, there is always more and the horizon keeps moving just a little farther out of reach. What is your ultimate #shinestrong hairstyle? Probably my awesome new bob! Inspired by Marion Cotillard, I chopped off my long locks into a relaxed bob with sideswept bangs. I feel powerful and grown-up and oh so polished. Every time I catch my reflection in a shiny surface inadvertently, I perk up a little. Is that vain? Share your best tip for strong, healthy hair. I nourish my locks with moisturizing shampoos and conditioners and a once-weekly deep-conditioning mask. A haircut that makes the best of my natural texture helps too: Instead of blowdrying and straightening my hair constantly, I blowdry the roots, work creme or straightening balm into the ends with my fingers, and let the rest air-dry. 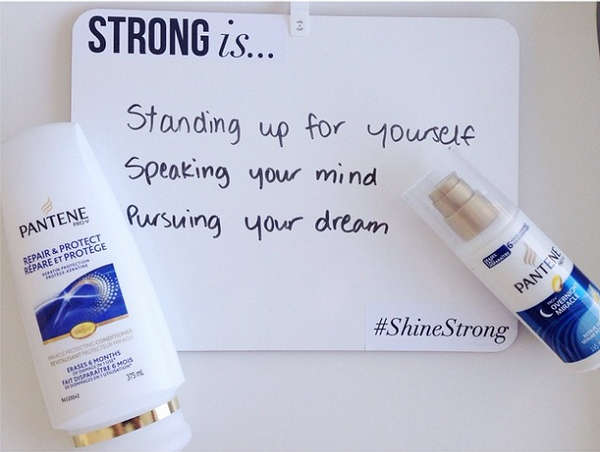 Finish this sentence, “I #shinestrong when I..."
Have the space to dream and think. lol love your answers. yeah I think happiness for me is having the freedom to do what I would like, whether that's eating somewhere for tonight or sleeping in on weekends. It's funny how much more simple our answers are compare to if we were to be asked these questions when we are in our teens. I know! Life really is about the simple pleasures.